Home » Journal Club » Fly Eyes! Imagine what it would feel like to be a fly, with most of your head covered in eyes, allowing you to see in pretty much any direction. That’s exactly what Axel Borst studies: motion vision in the fruit fly (Drosophila melanogaster), one of the most widely studied species of fly. The behavioral model that has most influenced the study of insect motion vision is the optomotor response: the syndirectional reaction to the motion of the surround that builds up slowly over time. As you can see in Figure 1a and Figure 1b below, when a fly is suspended in the center of a striped drum and the drum rotates in a particular direction, the fly also tries to turn in that same direction (Borst et al., 2010). Figure 1. Optomotor behavior and elementary motion detection. (a) A fly tethered to a torque meter is surrounded by a striped drum. (b) When the drum is rotating clockwise, the fly exerts a clockwise turn; when the drum is rotating counterclockwise, the fly tries to turn counterclockwise, too (from Heisenberg & Wolf 1984). This reaction is called an optomotor response. (c) A beetle walking on a spherical Y-maze (from Hassenstein 1991). (d) The Reichardt detector model for elementary motion detection. (e) A torque meter as devised by Goetz (1964). (f–h) Flight arena with tracks from individual flies, with a stationary panorama (g) and while the panorama is rotating at a constant speed (h) (from Mronz & Lehmann 2008). Figure 1d above portrays a Reichardt detector, an algorithmic model for elementary motion detection that consists of two subunits that are mirror-symmetrical to each other. As opposed to an ordinary speedometer, this model predicts an optimal speed at which the response is maximal. So, a Reichardt detector responds to specific spatial periods traversing a single photoreceptor, not to a specific image speed. 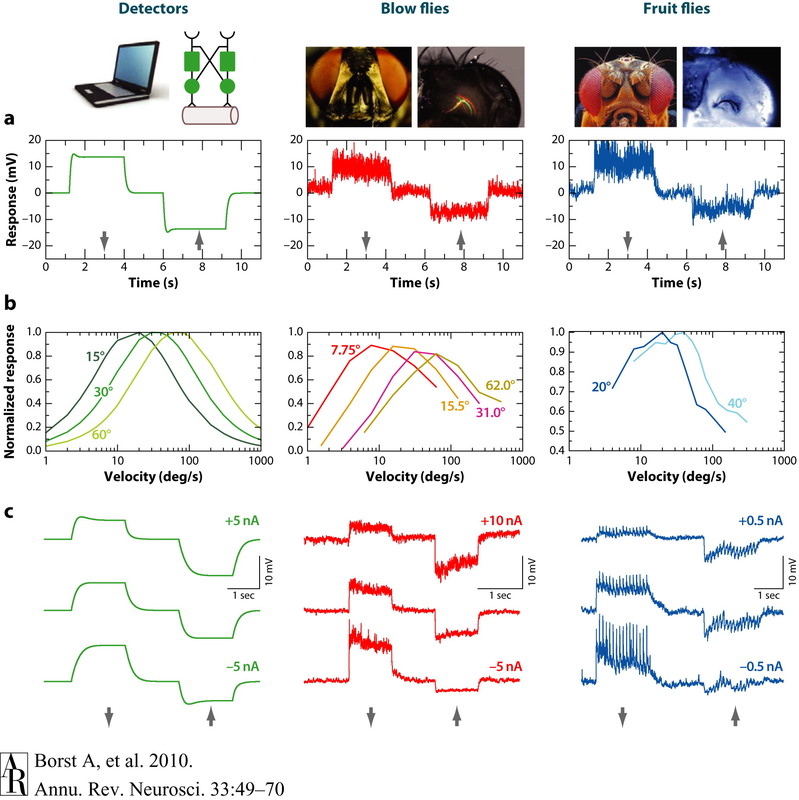 Below we observe the responses of an array of Reichardt detectors and of lobula plate tangential cells in blow flies (middle column) and fruit flies (right column) (Borst et al., 2010). Figure 2. Comparison of the responses of an array of Reichardt detectors (left column) and of lobula plate tangential cells in blow flies (middle column) as well as in fruit flies (right column). (a) Visual response to preferred direction (downward, indicated by the arrow) and null direction (upward) motion. (b) Steady-state responses to sine-gratings with different spatial wavelengths drifting at constant velocities. The optimum is shifted toward larger velocities with increasing wavelength of the pattern in such a way that the optimum is always at the same temporal frequency (ratio of velocity and pattern wavelength). This optimum temporal frequency is roughly 1 Hz in both blow flies and Drosophila. (c) Evidence for a push-pull configuration of local motion input to lobula plate tangential cells. Visual motion along the preferred and null directions was presented during injection of depolarizing and hyperpolarizing current in the recorded cell. When the cell is artificially depolarized, the preferred-direction (PD) response becomes smaller; when the cell is hyperpolarized, the null-direction response becomes smaller. Experimental data are from Haag et al. (2004), Joesch et al. (2008), and J. Haag & A. Borst, unpublished observations. Figure 2a above shows the visual response to preferred direction (downward) and null direction (upward motion). Figure 2b shows steady-state responses to sine-gratings with different spatial wavelengths drifting at constant velocities. Note how the optimum temporal frequency is 1 Hz in both blow flies and Drosophila (Borst et al., 2010). The figure below depicts a schematic of the fly optic lobe. The visual ganglia of the optic lobe consist of four layers: the lamina, medulla, lobula, and lobula plate. 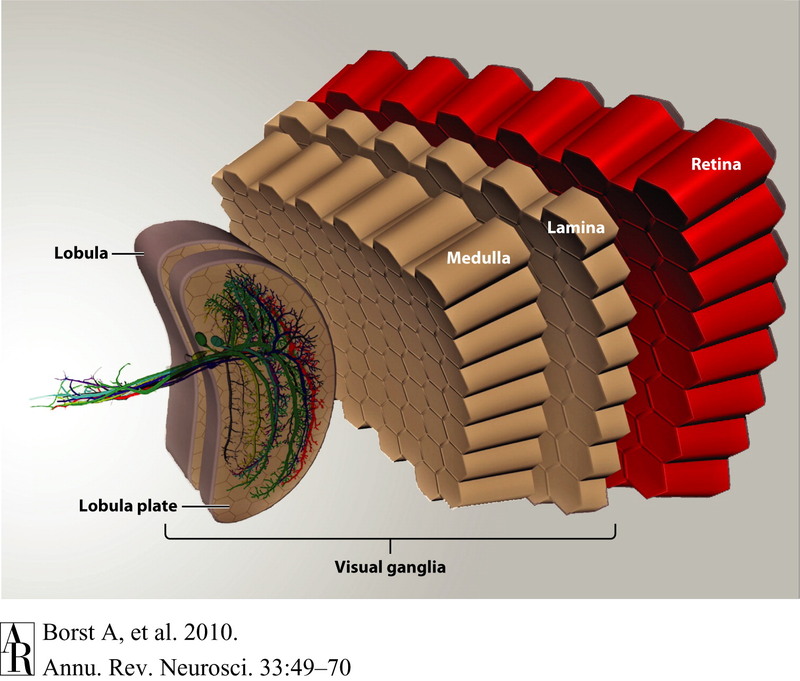 All these layers are structured in a retinotopic way so that adjacent image points are processed by neighboring facets in the eye and by neurons within neighboring columns in each of the layers of the visual ganglia. 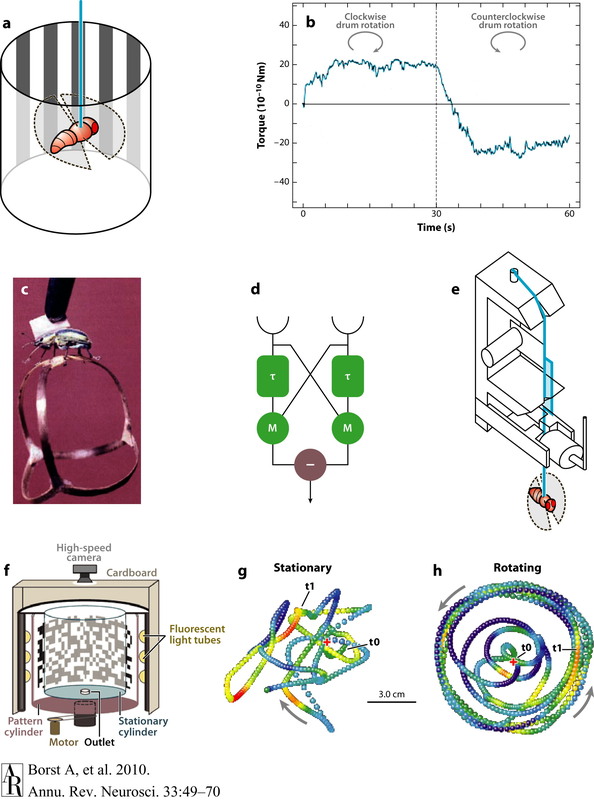 It is this unique organizational principle that endows the fly with unparalleled optic flow processing and visual course control abilities (Borst et al., 2010). Figure 3. Schematic of the fly optic lobe. In the lobula plate, the group of vertical system (VS) cells is shown as three-dimensional reconstructions from 2-photon image stacks of single dye-filled cells (from Cuntz et al. 2007). This research is important because it can allow us to develop artificial motion vision technology that can be used in critical applications like defense and security. For example, the models produced from this research can be used to build robotic flies that can detect imminent threats (moving or not), where ordinary surveillance is not possible or very difficult. Join us on Tuesday, May 28 at 12 pm in the CNCB Large Conference Room to hear more about Alex Borst’s amazing research! Shamit Patel is a Ph.D. student currently rotating in Prof. Tom Albright’s Vision Center Lab at the Salk Institute. His interests are in computational neuroscience, learning, neural circuit theory, dendritic integration, modeling of visual cortex structure and function, neural coding, consciousness, and nanoengineering of biosensors for brain activity mapping.